This months foodie pen pal box came from Nikki at Your Last Mouthful and it feels like the most personal box I've received. Everything in it is just so me. After you are matched with your foodie pen pal there's a brief back and forth about your likes and dislikes so your pen pal can fill your box with things you like or are interested in, it also means there's less chance of getting something you don't like. Nikki had a more detailed list of questions than I usually receive and as I filled them in I began to get quite excited. What was she going to be sending? If you could eat food from just one country, which would you pick? I used to live in Japan so I'm tempted to say Japanese food but I do love Italian too and French pastries! A little spice but not too hot. Curly parsley because I remember when that used to be served on every restaurant meal. For a spice, I'd say ginger because it's so versatile. Do you like unusual flavours? Would you be interested in trying some products local to me in Cardiff and in Wales in general? Macaroni cheese or anything black sesame flavoured. Anything you'd particularly like to try? Recently, I've been interested in Middle Eastern recipes but local produce is where my passion lies. 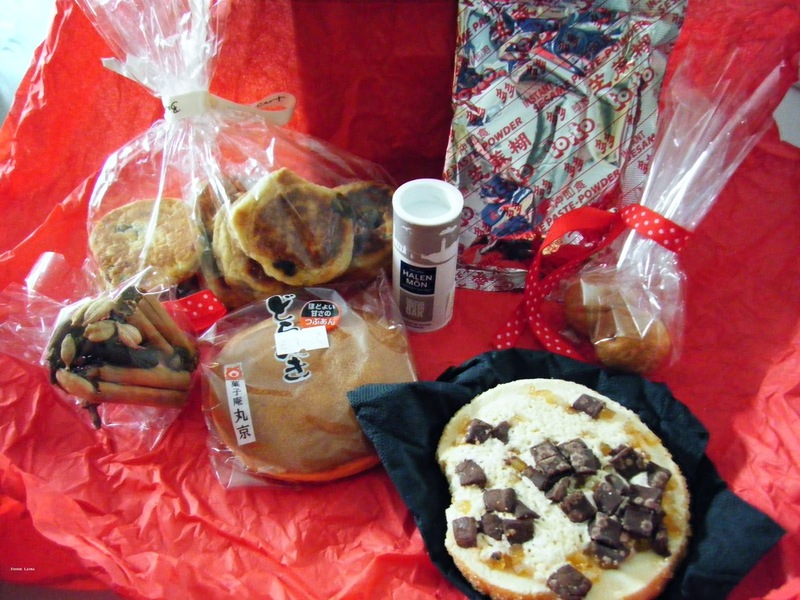 Nikki lives in Wales so she put Halen Mon salt and welsh cakes in the box, I live on the welsh border and smiled when I opened the welsh cakes as I'd also send some to my Dutch foodie pen pal this month as an example of great local produce. Great minds think alike! There are dried limes, which on first inspection I thought were cake pops that hadn't travelled well. I've never used dried limes before but Nikki uses them a lot in Middle Eastern dishes so I'm looking forward to using these. I love finding new ingredients. The dark chocolate and orange biscuit which came from Nikki's favourite French Patisserie is amazing, I couldn't resit a nibble before I took the photo and the remaining biscuit was snaffled up almost as soon as I'd finished taking the picture. The black sesame pudding has me very excited. I've been working on a black sesame pudding recipe for ages and it is blog ready now (*spoiler alert* the secret was condensed milk), I just can't seem to get it turn out out of the mould perfectly and it's taken too long to perfect, to not have a perfect pic to go with it. I was desperate to recreate a home made version of the instant Japanese black sesame pudding because I can't get a hold of it in the UK any more. Guess what? Nikki can! By the time this post goes live I should think the pudding mix will be long gone too. Just like the Japanese dorayaki which I am enjoying with a cuppa as I write. It's a pancake sandwich filled with red bean paste. The most touching part of the box is the chai mix. Nikki had read back over my blog and spotted my spiced chai latte recipe which is almond milk with a loose leaf Whittards tea. Only she created her own spice blend for me. I'm absolutely blown away. You must go and check out Nikki's blog Your Last Mouthful for more of her wonderful creations and if you like the sound of being a Foodie Pen Pal you can join up at This is Rock Salt.